Yesterday morning I woke up not feeling the slightest bit hungry. It may have been the larger than average meal I ate on Easter Sunday, but I was actually surprised I wasn’t hungry being as we ate lunch/dinner, “linner” at about 2:30, and didn’t eat much the rest of the day. Nevertheless, I knew I needed to eat something before heading off to work, so I whipped up a classic. 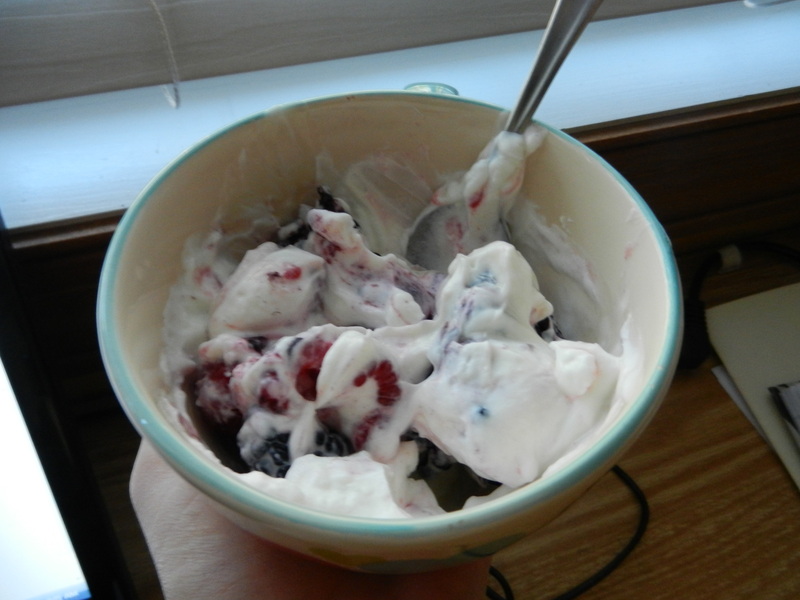 A heap of blackberries and raspberries, topped with Fage o% Plain Greek Yogurt, and finished off with a drizzle of honey. It was light, refreshing, and a healthy way to begin my day. Hunger finally set in at lunch time. I had packed leftover pulled chicken mixed with celery, carrots, pickles, and mustard, a big baggie of carrots and sugar snap peas, an apple, string cheese, and a Lara bar. That held me over well until dinner time. After work I headed to the gym. I began with 10 minutes on the elliptical, then moved to the stair master for 10 minutes, before hitting the weights. I was not in the most motivated strength training mood but knew I would feel good once I was done. I have been saying that a lot lately, huh? Anyway, I focused on legs today but really didn’t get too crazy: some leg presses, calf raises, leg curls, and that was it. Dinner last night was not very impressive (can you tell it was a tired Monday around here). I snacked on some more sugar snap peas as I deliberated what to make for dinner, realizing that we are running low on groceries. I decided on a wrap similar to a Greek one I had made not too long ago, but this time with a few less ingredients. Lawash Brand Whole Wheat Flatbread, hummus, feta cheese, and avocado. Super simple, lots of great flavors, and enough to keep me satisfied for a while. Now, with such a simple dinner, how is it that I manage to injure myself, whereas I can make elaborate dishes involving copious amounts of chopping and go unscathed? 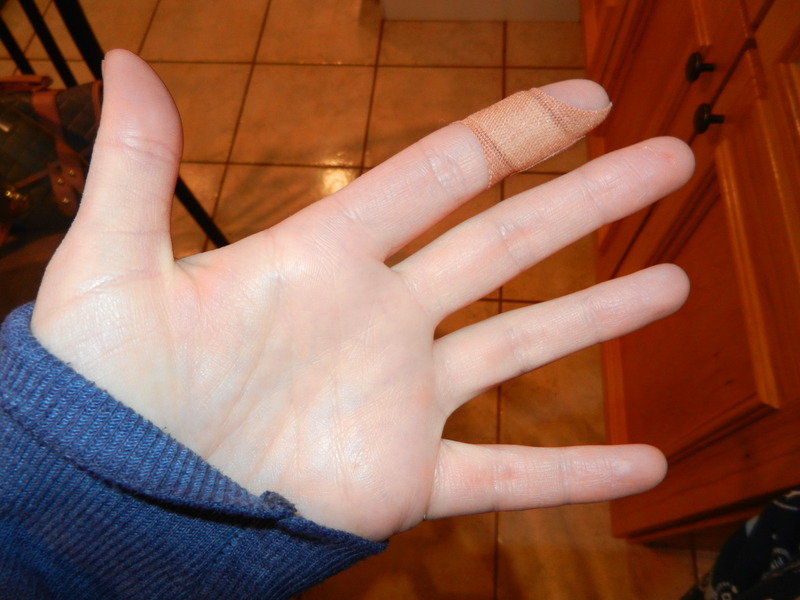 I managed to get in a fight with the pairing knife while trying to twist out the pit of the avocado. The one ingredient I needed to cut in this whole dish, and I managed to splice my finger open in the process. I got a little woozy but Dana kept me calm as I ran it under water and then put pressure on it. He bandaged me up and of course I am fine, but it did hurt and it’s always scary. Dana to the rescue. I can be a little dramatic. After dinner I had a few million Easter treats. It was my “Fat Monday.” I decided I had one more day to enjoy a bunch of my Easter treats before I put them away in the freezer for a while. They are now zipped away in a ziploc freezer bag in the freezer, in the garage. That’s what we have to do around here to keep our sticky fingers off the candies. This may seem a little backwards considering I just told you I hid all of my Easter treats, but I wanted to share a delicious recipe with you all for a treat I made last Saturday. One of my all-time favorite candies are Reese’s Peanut Butter Cups, however they aren’t the most figure-friendly candy. I wanted to find a healthier version of these delectable treats without sacrificing the wonderful peanut buttery flavor. I stumbled upon a recipe for healthier Reese’s eggs, I put my own spin on it, and this is what I came up with. In small bowl, combine milk and chia seeds and let sit for 10 minutes. 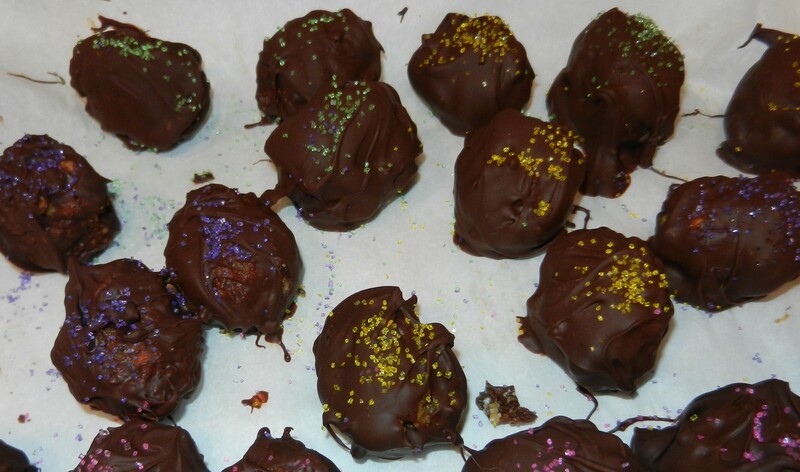 After ten minutes, combine chia seed mix with remaining ingredients except the chocolate chips; mix well. Shape mixture into small eggs, and place onto baking sheet lined with parchment paper. Refrigerate for 1-2 hours. Once eggs are chilled, begin melting chocolate chips in the microwave, stirring every 20 seconds until completely melted. 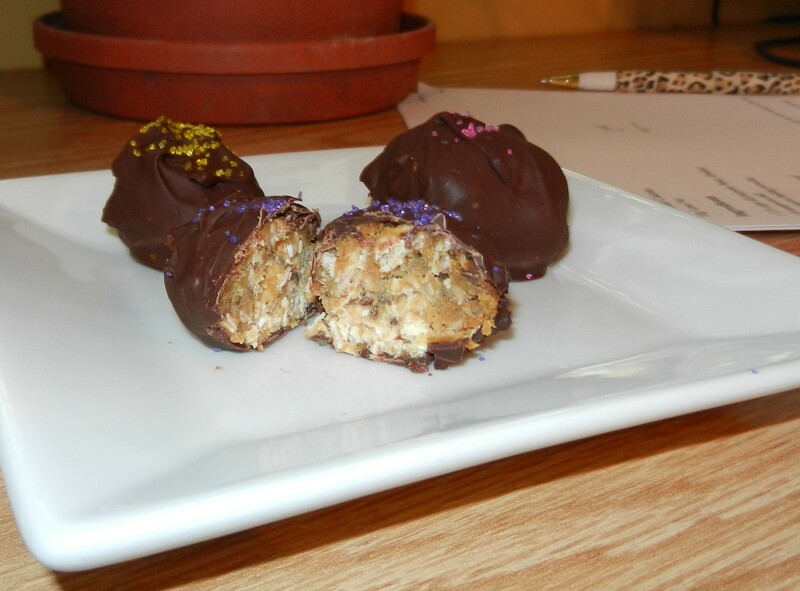 Roll "eggs" in the chocolate, covering them completely in the melted chocolate. Place them back onto the parchment paper. Decorate with sprinkles if desired, and return to the refrigerator. Allow chocolate to set before serving. Remove from fridge 15-20 minutes or so before serving. The inside of these eggs are soft yet chewy with the perfect amount of sweetness and peanut butter flavor. The chocolate on the outside of the egg adds a semi-sweet touch that balances the bites perfectly. They may sound a little off the wall being that they have chia seeds in them, but I’m telling you they are awesome! You don’t need a special occasion to make them either. Now, the candy and treats are all stowed away, and I refuse to fall back onto the sugar train. Anyone eat any delicious treats this past weekend? I would love to hear from you. Sharing is caring! 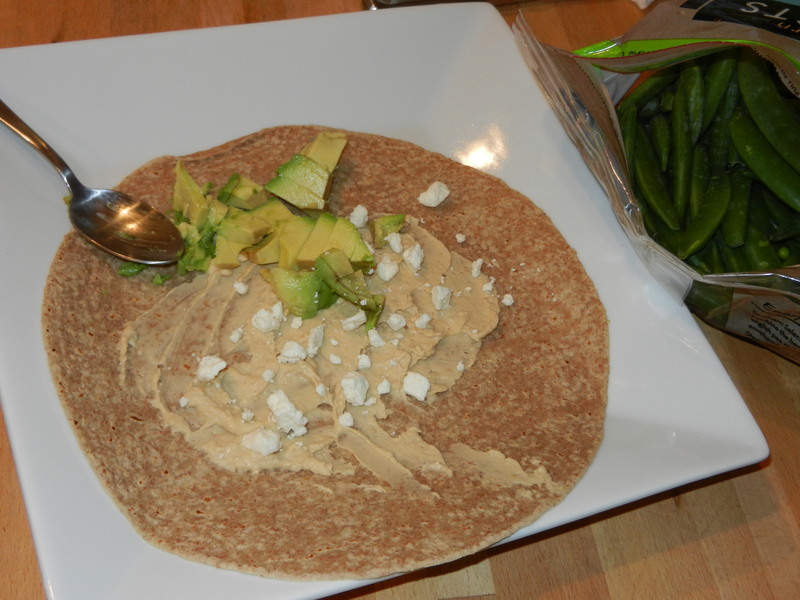 This entry was posted in Snacks, Sweet Treats, Workouts and tagged chocolate, FAGE, Oatmeal, PB2, Wraps, Yogurt by Melanie. Bookmark the permalink. What would happen if I made these without PB2? They would be great I’m sure!